Island Dreams' Ken Knezick has just returned from a dive cruise to West Papua, Indonesia, sailing aboard the M/V Indo Siren. That excellent cruise experience was followed by an equally productive land-based stay at Papua Paradise Resort. Ken's report focuses on the diving to be found in an intriguing region of West Papua known as the Raja Ampat (Four Kings) Islands. In addition to describing the travel required, best seasons to visit, and favored dive sites, this report discusses the relative merits of liveaboard versus land-based options. We hope you will find this information of value. RAJA AMPAT, West Papua, Indonesia -- In Bahassa Indonesia, Raja Ampat means The Four Kings, referring to the four main islands. Astride the equator, this remote island group sits just west of the Indonesia-claimed portion of the immense island of New Guinea, our planet's second largest island. Previously called Irian Jaya, in a nod to the history of the region, and the separatist ambitions of some of the local inhabitants, the Indonesian government allowed the region to be renamed West Papua. This area, and the neighboring country of Papua New Guinea, harbors some of the most remote and untamed territory left on earth. Equally in their natural habitat are the indigenous people here, some of whom still pursue an aboriginal existence in the primeval forest as practiced for many generations. As a result, much of the jungle, and the extensive fringing reef system, are still to be found in a relatively pure and unspoiled condition. GETTING THERE -- In the ongoing pursuit of pristine diving, the travels of an adventure-seeking scuba diver are becoming ever more circuitous. 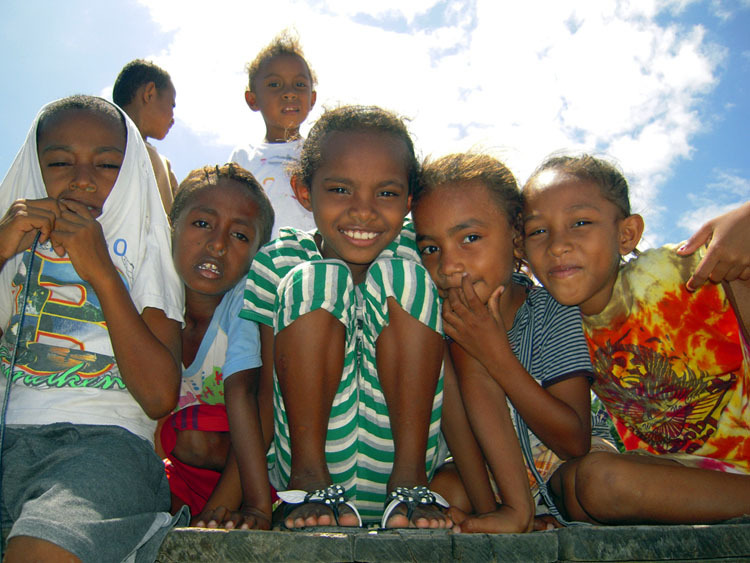 The trek to West Papua begins with air travel to Jakarta or Manado, Indonesia. These cities are served by a variety of international airlines. From there, one or a series of domestic Indonesian flights are then required to reach the far-flung city of Sorong on the southern shores of West Papua. The final flight legs may have relatively modest baggage allowances. To avoid paying overweight, pack carefully, and perhaps make use of rental scuba gear. (On the liveaboards, dive gear is often included in the price). Arriving finally at the rustic airport, our party was gratefully rewarded with the receipt of all of our luggage, and we were quickly transported to the M/V Indo Siren. EXPANDING DIVE TOURISM OPTIONS -- When I first visited Raja Ampat in 2002 I was part of Kararu's first expedition to the area. At that time, there was only one established liveaboard, the venerable Pindito, operated by early advocates of the region the Swiss brothers Edi and Robert Frommenwiler. In addition, there were two rustic land-based resorts operated by Dutch-born Max Ammer. As I began to see immediately upon exiting the airport on my recent visit, much development has occurred in the ensuing years. Sorong has grown exponentially, there are now more than a dozen resort options, some quite upmarket, and more than 40 liveaboards are currently operating in Raja Ampat. Island Dreams strives to keep up with this development, so give us a ring when you are ready to experience Raja Ampat for yourself. LAND-BASED or LIVEABOARD? -- This is a very large region, and a liveaboard will allow you a broader view of the many diving options. Though you may have some overnight traveling to do between areas, once in place your floating base of operations will always be close to the dive sites. Selecting one or two land-based resorts can also give you a good Raja Ampat experience. 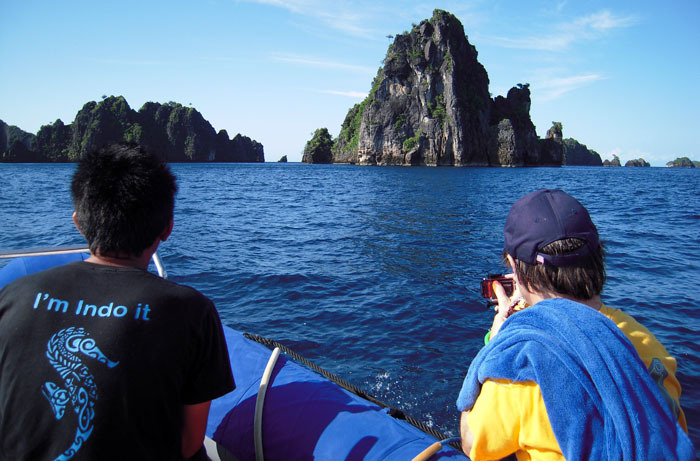 But some of your boat rides may be an hour or more to select dive sites, and you may stay out for two or even three dives, with a packed lunch. But one valuable advantage a land-based resort can give you is a better contact with the jungle, the prolific bird and other wildlife, and perhaps some interaction with the local people. If you have the time and resources, an ultimate Raja Ampat experience might well combine a liveaboard cruise and a land-based resort experience. That's the way my trip played out, and I was very grateful for having had both options. 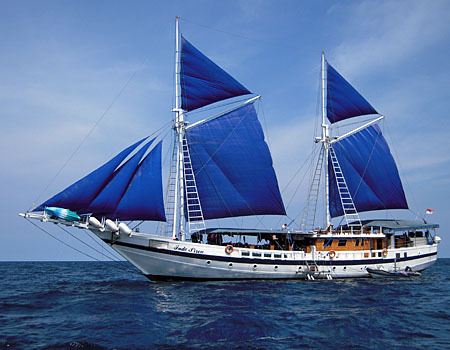 M/V INDO SIREN -- With 40+ liveaboards plying these waters, how is one to choose the best option? Quite a few of the vessels are competing to be in the highest category of luxury, service and price. That would include boats like Aernui, Dive Damai II, and Dewi Newsuntara. If you have the money to spend, all are excellent choices. Many other liveaboards now in Raja Ampat are working the other side of the spectrum, smaller boats with lower standards of accommodation, and pricing commensurate. M/V Indo Siren seems to fall into the sweet spot. Without being overly luxurious, she is a purpose-built vessel perfectly suited to the task. Indo Siren is made of fine hard woods, is quite heavy, and does not have the two-deck super structure of some of the other Pinisi-style boats. As a result, she offers a very smooth and stable ride, even in troubled seas. From my experiences aboard Indo Siren, the Captain, boat crew, dive crew and the galley all get very high marks. PAPUA PARADISE RESORT -- My interest in this property originated with its new management, Gaspare Davi GM of Gangga Island Resort. This man is a legendary hotelier, and his expertise shows at Papua Paradise, especially in the well-trained and accommodating hotel and restaurant personnel. Here you will enjoy comfortable lodging with an ultimate ocean view, pleasant dining room and varied cuisine, lovely island setting, easy hiking, great birding, a dugong in the back bay, a nice shore dive, very fast dive boats providing up to four dives per day, and a very low guide to guest ratio. Courtesy of two very fast speed boats, we dived many of the same renowned northern Raja Ampat dive sites that I had visited with the Indo Siren. The house reef was pretty good, but some of the other reefs closest to the resort were in less than top condition. An extra special treat was the live local music. The various staff members, when not on duty, were sitting at a little gazebo outside the restaurant, playing guitars, bass, percussion and singing in wonderful harmonies. What an unexpected treat. Overall, Papua Paradise Resort exceeded my expectations, and I would definitely return. First Dive at Two Trees Island - Two Trees is deceptive. It's a tiny island at the surface, but features a huge reef system underwater. Visibility was in excess of 100 feet, with beautiful hard corals near the surface giving way to forests of colorful black corals, soft coral trees, sea fans, and bright orange sponge, all swarming with many thousands of glass fish and all manner of reef fishes. Adding to the fun, a large school of sardines swarmed near the surface as they struggled to avoid attack by mobula rays rushing in to feed upon them. Quite a checkout dive... welcome to Raja Ampat! No Doubt - This was, for me, one of the most memorable dives of a star-studded dive trip. Descending on a steep slope at 7:30 am, the morning sun was just beginning to glow over the crenelated reef crest. From a backlit forest of soft coral trees, we floated to a series of three pinnacles jutting out of azure blue water. The top of each pinnacle were jutting coral buttresses covered in a wild soft coral pallet and swarming anthias. 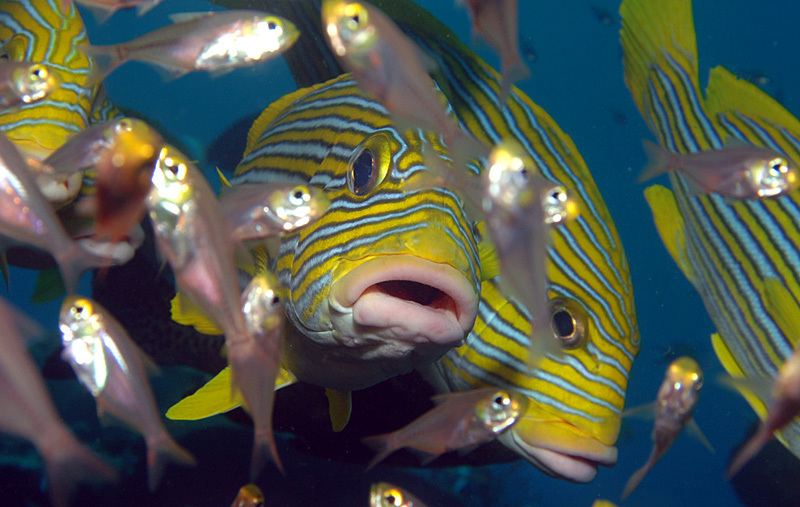 Passages in the coral were ambuscades for snapper, coral trout and oriental sweetlips. At one point I had the sensation of being watched. Over my shoulder a school of large bumphead wrasse seemed to scrutinize me with impassive yet critical eyes. I ignored their skeptical gazes and enjoyed one of my all-time favorite wide-angle photo dives. Perfect timing, lovely soft light, just enough current, and fortunately some pretty good photos to document the day. Magic Mountain - We made this dive before breakfast, and it certainly turned out to be a wakeup call. Topside conditions were a bit dark and rough as we back rolled in from our dinghy. Descending in the blue, the water was dark but quite clear as the Mountain revealed itself. 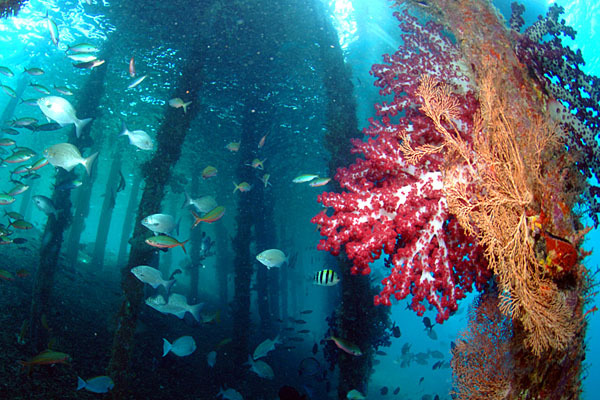 First photo subject was a lovely arch covered in multi-colored corals with larger snapper sheltering in the shadows. 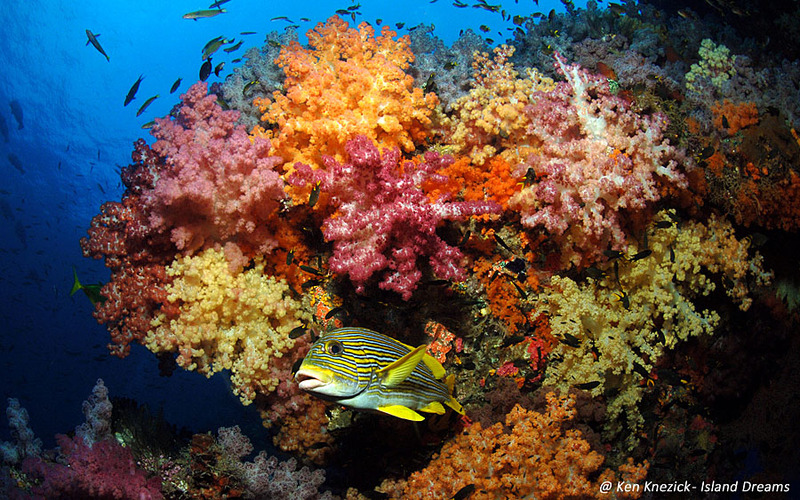 Around the wall was a rainbow profusion of soft corals and large sea fans. The shallows were rich with hard coral bommies wreathed is leather coral and waving brown soft coral trees. Ahead I spied my dive buddies hunkered down in 25 feet of water, feeling very lucky to be watching a giant manta ray at a cleaning station. Periodically, with a tiny flick of its great wings, it would rise in the water column and wheel back over our heads before returning to being cleaned. What a fine way to start another day of Raja Ampat diving. Wedding Cake - This site started out as a rather typical rubble bottom macro critter dive, but by swimming around a cornice into the current area I soared into a private Shangri La of lush soft corals and red whips waving a above a vast bed of orange tubeastrea. The countless colorful anthias and flashing fusiliers were joined by an array of big snapper, various jacks, small tuna and even one sleek kingfish. I reveled in this personal heaven as long as my dwindling air supply would allow, then finally let go and reluctantly allowed the current to return me to earthly existence. Sardine Reef - Underwater electricity to start our final dive day of the cruise. Jumped into a frenzy of large jacks chasing schools of prey fish at high velocity. A healthy current had the soft corals in full bloom. Sleek black-tip sharks, big napoleon wrasse... and for icing on the cake (and to tease me for shooting wide-angle all the time) a beautiful greater blue-ringed octopus. Cape Kri - Aquarium diving at its best. Beautiful reef crest, colorful hard corals swarming with tropical fish life, and predator fish darting amongst them. Frequent "fly-bys" by black-tip reef sharks and the occasional turtles and cuttlefish. Manta Sandy - The cruise itinerary sagely saved this famous site for our last full day of diving. Making a quick descent to a sandy bottom, we took up kneeling positions on the sand in 50-feet of water, cameras and strobes bristling, and waited for the show to begin. First one large manta ray, then many, came to visit a cleaning station just in front of our lineup of enthusiastic divers. Some of the mantas had a wingspan of 15 feet and arrived with a school of yellow pilot fish hovering around them. The great mantas would linger just above the sand to take on a crew of cleaner fish composed of small wrasse and damsel fish. Occasionally, as if for sport, a manta would fly directly over our heads, letting our bubbles tickle their bellies. I was down to 800 psi and thinking about beginning my safety deco stop when a group of three, then five, six and eventually eight giant manta rays took up station before us, jockeying for position. What a great way to start another day of diving... .and to bring a great dive trip full circle. Palau Dua and Fish Heaven - These two sites, just a ten-minute boat ride from Papua Paradise Resort, offer yet more delightful aquarium diving. Giant bumphead parrotfish, as big as any I've seen. Napoleon wrasse, then a fabulous school of Oriental sweetlips floating amidst a sea of glassfish, made for great wide-angle photo subjects. The large coral heads were also host to many pairs of lovely butterfly and angelfish, and colorful anthias galore. SEASONALITY and WATER TEMPERATURE -- World weather patterns become increasingly difficult to peg with accuracy. But it is generally acknowledged that this Equatorial region experiences two rainy seasons each year, in November/December and again in July/August. 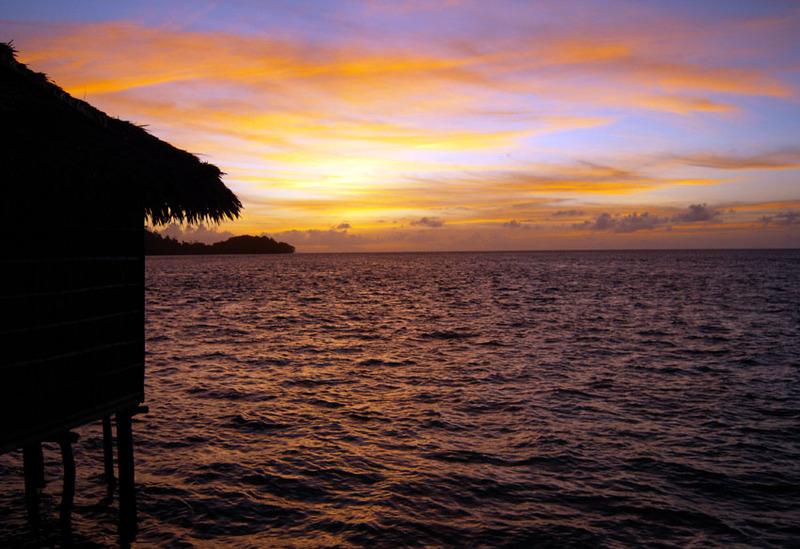 The dive resorts, and most of the liveaboards, operate year round and it is still diveable during those seasons. The best weather conditions for diving may be found February through June, and again during September and October. Notably unusual for Indonesia, water temperatures are expected to remain in the range of 78-82 degrees Fahrenheit throughout the year. Those who have experienced the colder waters around Komodo will appreciate the pleasant water temperatures of Raja Ampat. Still I would recommend that divers come prepared with a full wetsuit and perhaps a mini-hood or hooded vest. 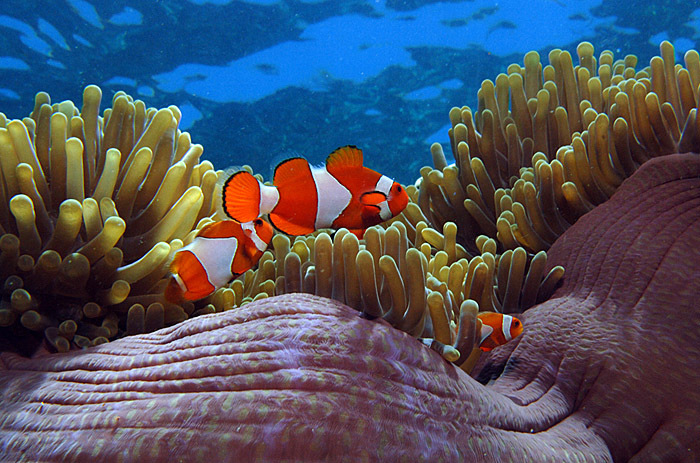 UNDERWATER PHOTOGRAPHY -- In the water you will find broad application for both wide-angle and macro set-ups. 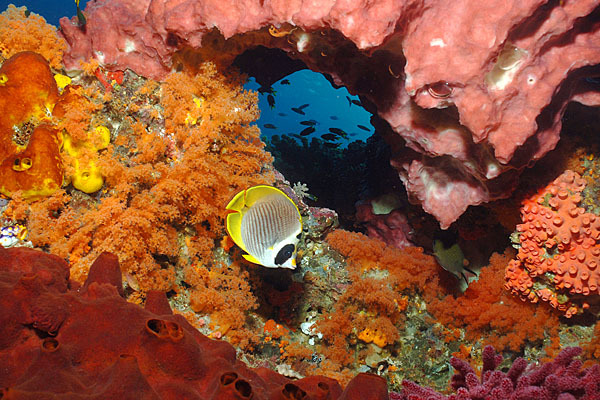 But for me, underwater Raja Ampat is all about the wide-vista scenery. Plan for large coral bommies swathed in a rainbow of soft corals and swarming with bait fish below and predator species above. 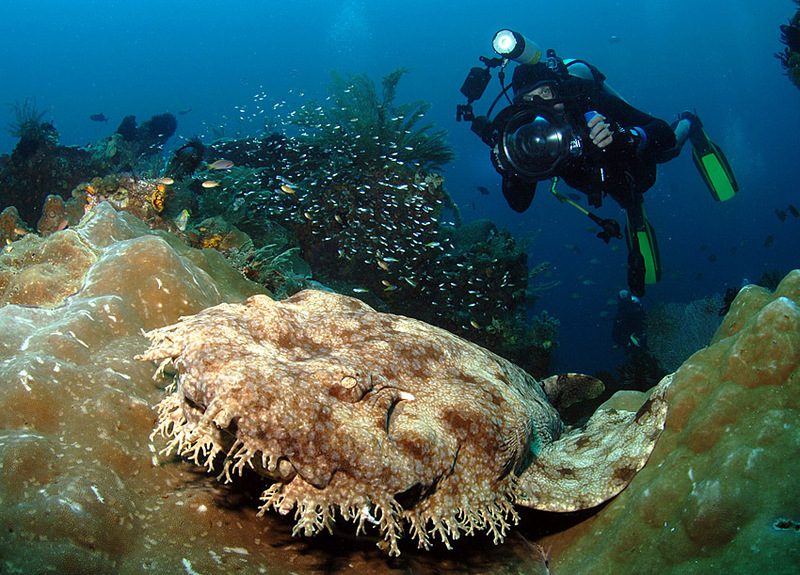 Some dives specifically feature giant manta rays, and others wobbegongs, reef sharks and mobulas. It's a challenging enterprise, but wide-angle photography can be very rewarding here. THINGS to BRING -- Good live-aboard boats are proud of their air-conditioning. So pack a light warm-up suit, at least one long-sleeved shirt, and perhaps a lightweight fleece jacket or pullover. Siren Fleet has the unique policy of taking away your shoes as you come onboard. Guess they are protecting their fine teak decks from rub marks. So you might care to bring a pair of soft slippers, or something similar, to wear in the salon. Other than that, whether you are liveaboard or land-based, clothing requirements are relatively simple. You won't need much more than a few t-shirts and shorts, and good shoes for the shore excursions. Bring multiple, quick-drying bathing suits so you will always have a dry one. And definitely have good sun protection, including a broad-brimmed hat and sunblock. TOPSIDE DELIGHTS --No Komodo dragons in Raja Ampat, but there are still some fascinating topside experiences to be enjoyed. For those interested, this is a superb region for birding, including opportunity to see the Bird of Paradise and lots of hornbills. Even casual observers will see many new species of exotic bird life. There is also unique topography, everything from remote white sand beaches, sheltered coves and limestone caves, to heavily forested hillsides, jagged karst formations, and dazzling views of verdant rock islands floating in turquoise blue waters. PHOTO GALLERY -- As a picture can be worth many words, I've posted some representative photographs on the Island Dreams Facebook page. Find that gallery here. Raja Ampat Photo Gallery and/or Join Island Dreams Travel on Facebook. THE BOTTOM LINE -- The Indo Siren is an excellent dive platform, with a friendly, experienced and accommodating crew. Papua Paradise Resort proved to be an equally satisfying option. The quality of the diving available in Raja Ampat was nothing short of excellent. If your prime interest is critter diving and muck diving, Indonesia may have even better alternatives for you elsewhere, such as Lembeh Strait. But if you wish to see virgin coral reefs swarming with countless schools of fishes, there are few places in the world more prolific or satisfying than Raja Ampat. The lack of local human population should hopefully allow this area to remain relatively pristine for some time to come. For my part, I found this fishy diving immensely satisfying. Wide-angle camera system at the ready, I look forward to coming back for more.